Rose Coschignano/Staff Photographer The Binghamton University Symphony Orchestra celebrated the sound of four cities around the world in its first major concert of the fall semester. A handful of the world’s metropolitan wonders were honored this past Saturday, Oct. 20 when the Binghamton University Symphony Orchestra performed its first major concert of the year, “Great Music for Great Cities,” and one of the last concerts this season under longtime director and music department professor Timothy Perry. The concert highlighted pieces by Edward Elgar, Leonard Bernstein, George Gershwin and Ottorino Respighi, all composers whose works often found creative inspiration in the hustle and bustle of city life. Before beginning the concert, Perry addressed the audience composed mostly of family members of the student musicians. The inspiration behind a program dedicated entirely to major cities, he stated, is the increasingly important role these municipal entities play in funding fine arts programs in contemporary society — a responsibility that has historically been the strict domain of private donors. 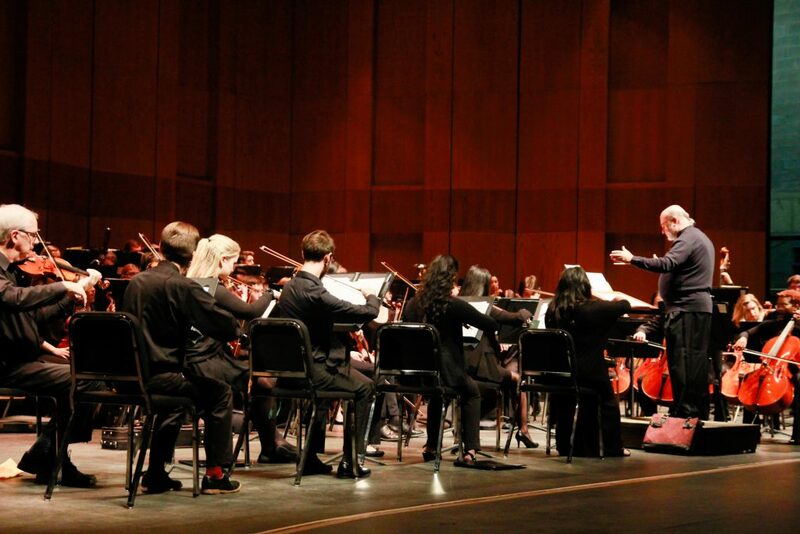 He further prefaced the concert by declaring the proceeding program to be one of the most difficult opening day programs he has ever performed with the Symphony Orchestra, a statement that he believes reflects the skill of this year’s ensemble, which is composed almost entirely of nonmusic majors from over 20 different academic backgrounds. The first piece performed was Elgar’s “Pomp and Circumstance March No. 4,” a short work whose straightforward composition depicts the regality and prowess of early 20th-century London. In contrast to this work was Bernstein’s “Three Dance Episodes,” which celebrates the bombast and excitement of New York City. Originally appearing in his show “On the Town,” the contrasting tempos and compelling orchestration of these dances by Bernstein frame the 24-hour sojourn of three sailors in the Big Apple and all the spontaneity that accompanies them. Right before intermission, the Symphony Orchestra performed “An American in Paris” by Gershwin, a jazz-infused composition that tells the story of an expatriate’s fascination with the cosmopolitan French capital and the eventual homesickness that befalls him there. Following intermission, the Symphony Orchestra performed “The Pines of Rome” by Italian composer Respighi, a composition audience members may have recognized from its inclusion in Disney’s “Fantasia 2000.” The colorful orchestration and powerful finale of this composition provided a triumphant end to the concert, and produced an extended applause from the audience. For Kate-Lynn Rice, an undeclared freshman, the concert was a good way to break the habit of the school week. The next BU Symphony Orchestra concert, “Very Varied Variations,” will take place at 3 p.m. on Saturday, Dec. 1 in the Osterhout Concert Theater in the Anderson Center and will feature cello soloist Zachary Sweet, a lecturer in the music department.